Perrott Painting holds safety as the highest priority when it comes to completing painting projects. Our estimators are not only experienced in painting, but also understand the importance of safety in the workplace. This often means that, when quoting, extra time is considered to ensure our painters have adequate time to, for example, build a scaffold correctly and ensure its safety. All Perrott Painting employees are given our Employee Handbook, which details the company’s expectations when it comes to Occupational Health and Safety. All employees are educated in completing company Job Safety Packs, JSA’s, safety checklists etc and all new employees must complete a workplace induction. ASSA provides Perrott Painting with the support and information needed to maintain our OH&S policies and procedures. 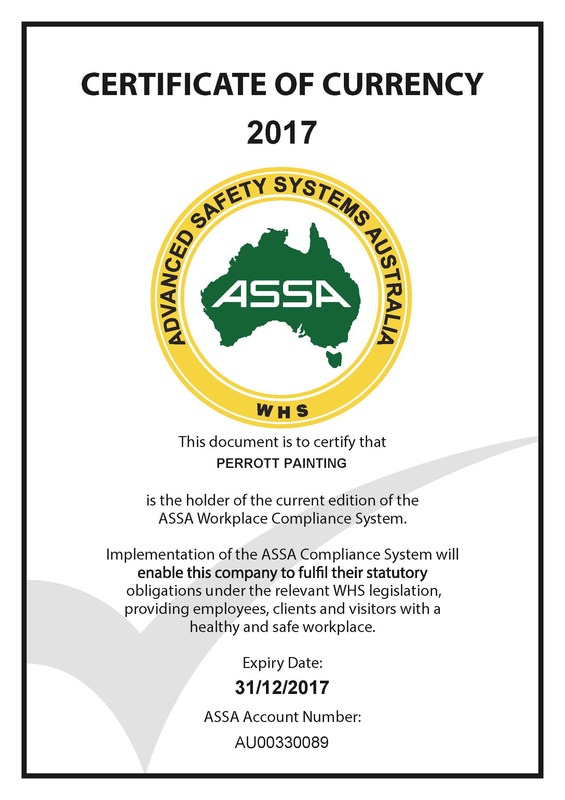 Perrott Painting have been affiliated with ASSA since 2014 and we rely on them to keep us up to date with new legislations affecting the health and safety of our industry. ASSA also provide assistance with our environmental policies and obligations to ensure we have the correct processes in place to minimise the impact on the environment from our business. 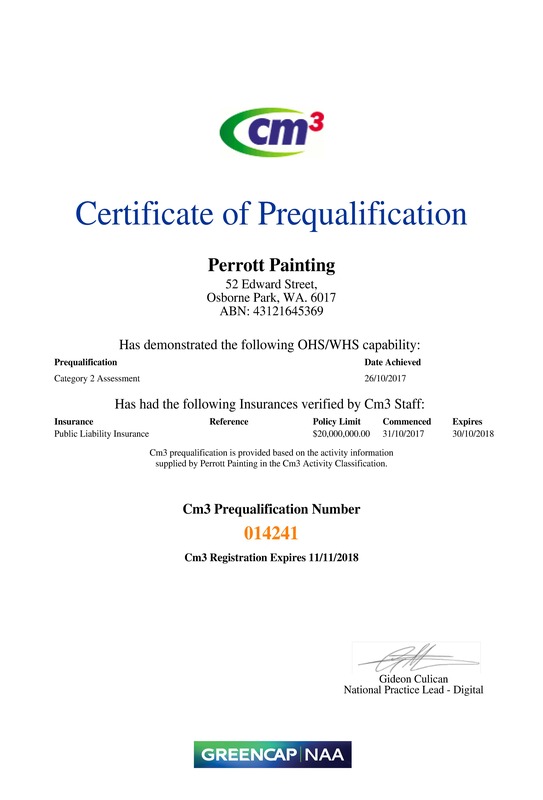 Perrott Painting has been accredited with Cm3 since January 2015. Cm3 is Australia’s leading online Contractor OHS/WHS prequalification system. Cm3 addresses the need for contractors to demonstrate health and safety management capabilities and this is reviewed and assessed on an annual basis. Perrott Painting’s accreditation was achieved after an extensive assessment of our company’s Occupational Health & Safety policies and procedures. This accreditation recognises our company’s ongoing work and dedication to maintaining and improving on our internal OH&S systems.